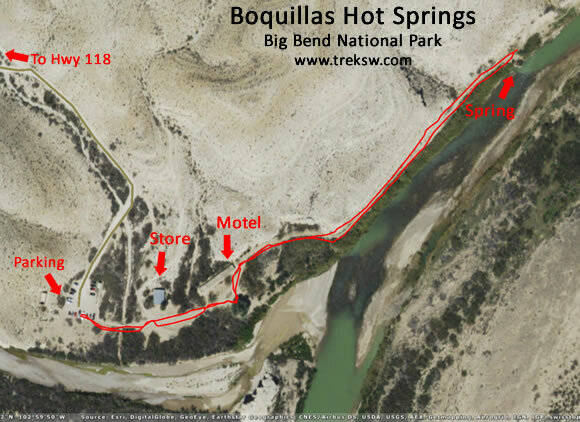 A short day hike down to the historic Boquillas Hot Spring on the banks of the Rio Grande. 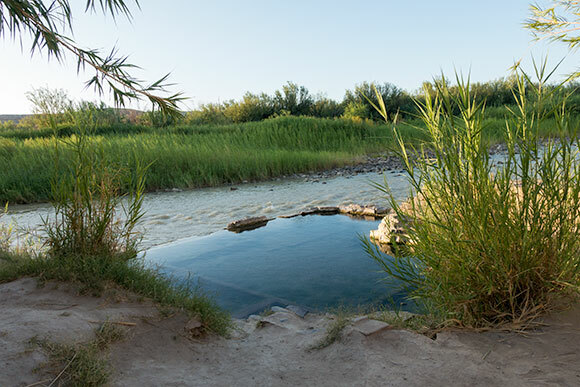 If you’ve spent the day, or a few days, hiking in the rugged Big Bend Region, the perfect way to soothe your sore muscles and feet is a soak in the 105 degree Hot Springs along this trail. It has been believed for over a hundred years to have restorative powers for the body and mind. Maybe that’s due to the trace amounts of lithium in the water that bubbles up out of the rocks here (along with calcium carbonate, calcium sulfate, sodium sulfate and sodium chloride). To get to the road leading to Hot Springs Trail, starting at Park Headquarters at Panther Junction, take a right out of the parking lot onto Highway 118 heading toward Boquillas/Rio Grande Village. The turn-off to Hot Springs Road (29.196109, -103.001448) will be on the right in approximately 17 miles and just a couple of miles past the right-hand turn to River Road. You should see a sign indicating the turn-off to Hot Springs just before you get there. The 1.6 mile dirt road leading down to Hot Springs Trail is very narrow, so don’t try it if you’re in a dual wheeled vehicle or motorhome. 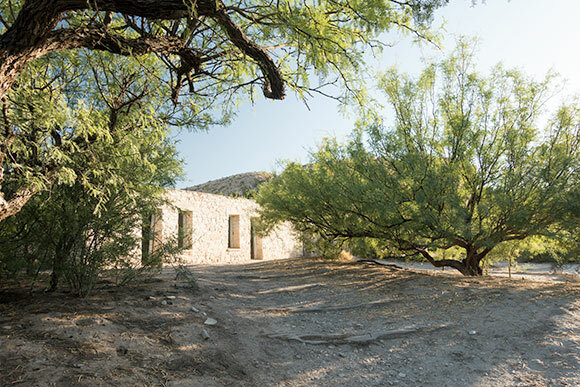 In the parking area for Hot Springs Trail, you’ll notice a house on the hill to your right (This belonged to a man named Charles Livingston, from Alpine Texas). You’ll see to your left bathrooms and the trailhead for Hot Springs Trail. 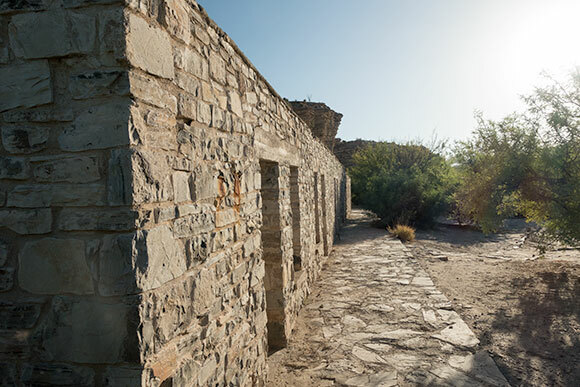 Shortly after you begin the trail, you’ll arrive at the original Hot Springs Store. Although J. O. Langford originally settled the area around 1909, he and his family left around 1912 due to bandits making the area unsafe. When he and his family returned in 1927, they built the store and motel you see in this area today. 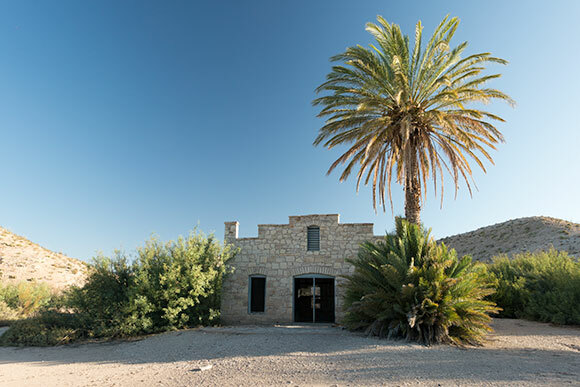 J. O. Langford bought the Hot Springs area in Big Bend National Park around 1909 after hearing about its fabled restorative powers on a trip through Alpine, Texas. Mr. Langford was a Mississippi native who had contracted malaria as a child and had suffered from it most of his life. 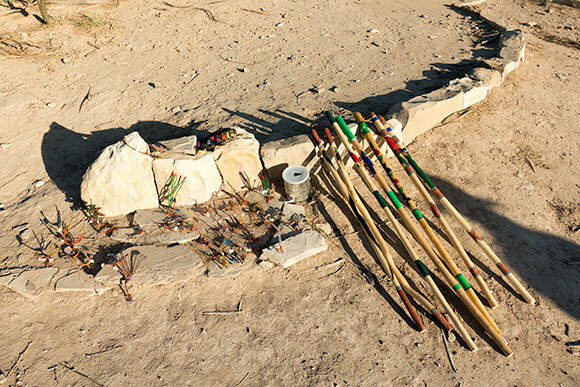 Upon hearing about these restorative powers, he bought the land surrounding the hot springs, site unseen. Although Mr. Langford sold the Hot Springs area to the State of Texas in 1942 for the formation of the park, Maggie Smith stayed on and ran the store until it was finally closed in 1952. Notice the large non-native palm trees in the area. Although they aren’t native to this area of the Rio Grande, they provide lots of shade for visitors. The hotel built by Mr. Langford houses seven small rooms with plastered walls, hand painted with various murals. Since this popular trail skirts the river, Mexican Nationals cross the border and place their knick-knack stands here to entice American tourists to purchase and donate. You are not supposed to buy these items (they’re considered contraband by the Border Patrol). If you truly want to buy something, you should consider crossing into Boquillas and buying something on the Mexican side, then bringing it back across. Just don’t forget your passport. Once you pass the hotel and store area, you’ll be walking alongside a cliff wall on your left and the Rio Grande on your right. 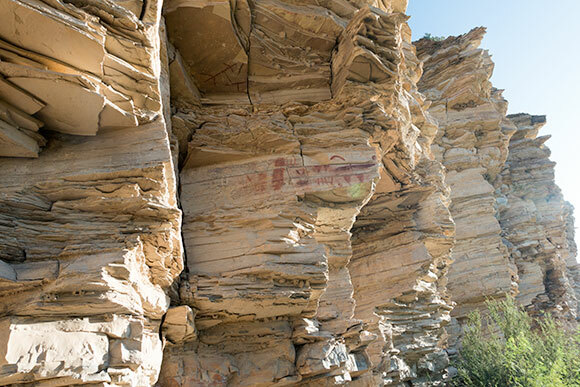 Keep an eye out here for markers indicating the presence of pictographs (images drawn on the walls) and petroglyphs (images carved into the walls). The images below are believed by the Parks Service to represent dart points, and to date back from 1,000 B.C. 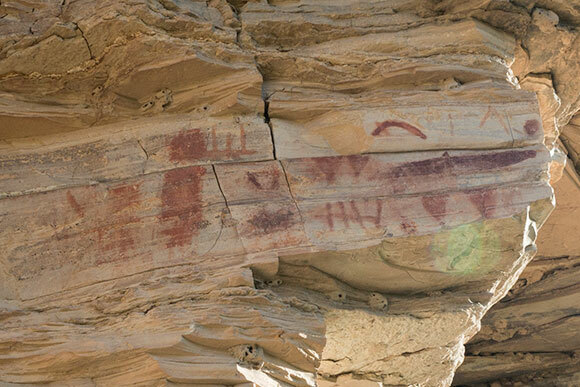 to 200 B. C.
You’ll also find kitchen middens, more pictographs, and some petroglyphs in this area. 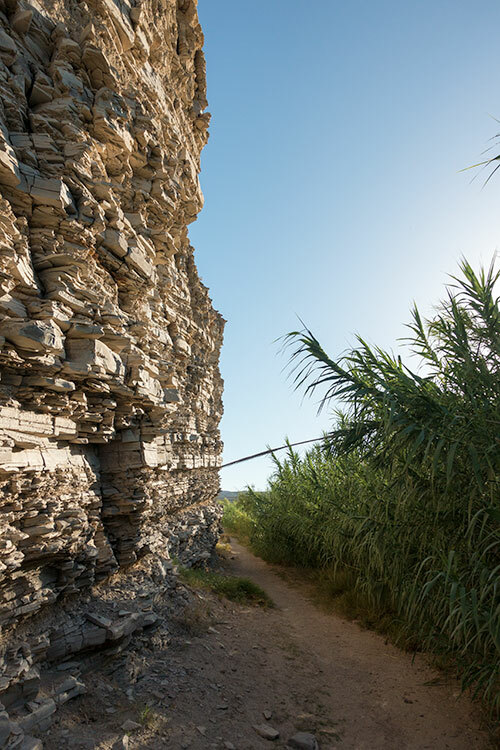 In the picture below, you can see the cliff wall on your left with the dense reeds bordering the Rio Grande on your right. Just a short walk further down the trail you’ll arrive at the hot springs, where the foundation of the bathhouse once erected by Mr. Langford still sits. The hot spring here flows almost 250,000 gallons of water every day at a constant 105 degree temperature, year-round. Mr. Langford hired stone-mason Herman Jacobs to build this bathhouse shortly after he acquired the land in the area. 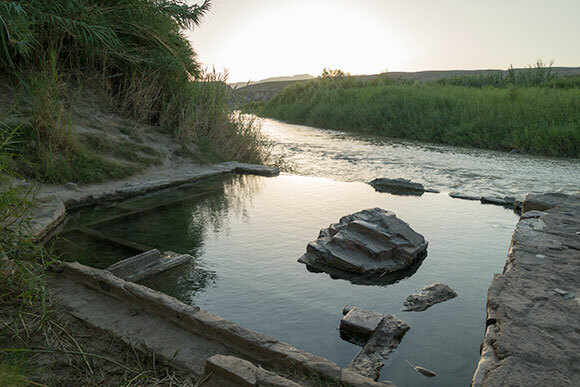 But, before he did anything in the area, he spent almost thirty days bathing in and drinking the water from the hot spring in an effort to cure his malaria. Based on his book “A Homesteader’s Story,” it worked. Sometimes, when the Rio Grande is high, it can be over the top of the hot springs. You shouldn’t get into it when river is that high. It can be dangerous due to strong currents. Once all of your ills have been cured and your mind restored to peak performance (and you’re ready to head back to the parking area), you have two choices; you can either retrace your steps, or go a little further and take the loop back. To take the loop back, just head another 1/4 mile down the trail to a junction. Once at the junction, take a left and follow it up the cliff and around the backside of the historic area. Are swimsuits required in the hot spring, or do people use it “au naturel”? Swimsuits are highly recommended. It’s a family spot. Don’t be the guy in the pool with no draws when the school bus shows up. Thanks for the great info. Is it possible to do this hike and the Boquilla border crossing the same day? Depends on how much Carta Blanca you drink in Boquillas. I would suggest doing the Hot Spring hike at sunrise, then doing the crossing afterwards. The trail is beautiful at sunrise. Perfect! Thank you so much for your quick response! Yes ma’am. Enjoy your trip. I’m just wondering. Looks amazing. No, that’s the Rio Grande next to the hot spring. The spring bubbles up from the rocks right next to the river. YES – the spring is essentially surfacing near the Rio Grande and the ‘square’ is the man-made (early 20th century by J.O. Langford) remains of a 2-story bathhouse. The square corralled the water for Langford’s enterprise. The National Park Service dynamited the remains of the bathhouse in the 1950s or early 60s. (not sure of the date). Water in the ‘square’ Hot Spring pool is a consistent 105 degrees F. Hope that helps.